In this article you will get the full tutorial to make a good looking scenery with minimum efforts, you just need to follow all the steps as given in the post and you will be able to make a beautiful scenery painting having huts, grasses and clouds. Painting is always a trendy way that captures the minds of small kids. Apart from playing cricket and football kids also has a passion for drawing paintings. This tutorial is especially meant for the kids to make a scenery step by step. You just need to focus on the points and implement those in your painting books. All the points are well defined and explained, if you got and issue or stuck with any step then just drop a response below and we will happily make it more clear to you. 1. First Step is very simple you just need to make a straight line on your drawing book. 2. Now you need to make a new line linked with the first line in such a way it will make an angle of 110 degree. 3. On the third step, make a parallel line to the line which we have drawn with step 1 and make it linked with the second line. For help please referrer here. 4. Join the ends of the the first line and the third line, you will get a shape like a trapezium. 5.Now make a half triangle linked with the trapezium shape. 6. Make a one sided open rectangle below the trapezium shape and try to make the lines straight, you can even use a ruler. 7. Now Make a 90 degree angle between the half triangle and rectangle. You will get a shape similar to a hut, now you just need to make it more beautiful. 8. Make a new line on the right hand of the triangle to make a perfect roof and to give your hut a professional look. 9. Now make a window inside the rectangle, click here to get a clear look. 11. Make a new hut similar to the first hut on the right side of your sheet. 12. Now you just need to color the painting, color the blue color in the sky. 13. Make a green crayon color in the nearby space of the hut. 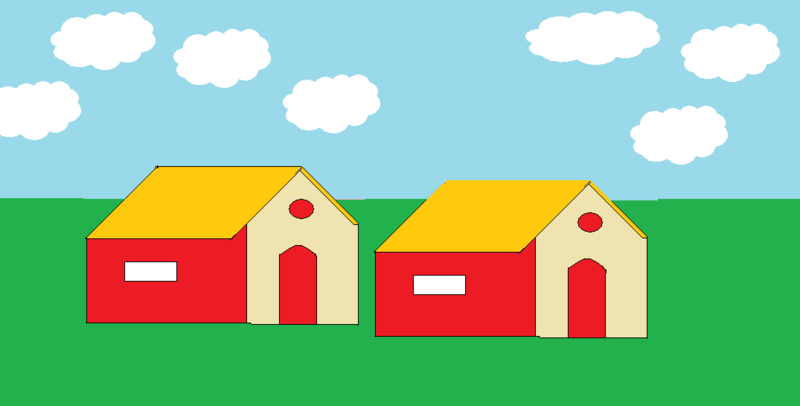 14.Make the huts beautiful by coloring as you want.